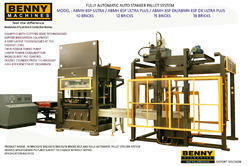 We are the supplier of "Automatic Fly Ash Brick Machines" from Coimbatore, Tamil Nadu, India. Heavy duty jig welded main body. Power saving up to 15%. Looking for Fully Automatic Fly Ash Brick Making Plant ?